MASTR, Mammography Assessment Search Track & Report ~ FDA approved and BIRADS & MQSA compliant. It is a mammography tracking solution that is Internet accessible from any personal computer or platform with Internet access. Designed in part by radiologists, technologists and Imaging Center personnel, the functionality is nothing short of fail-safe. No patients fall through the crack and Pathology results are automatically imported from the lab, regardless of locale. 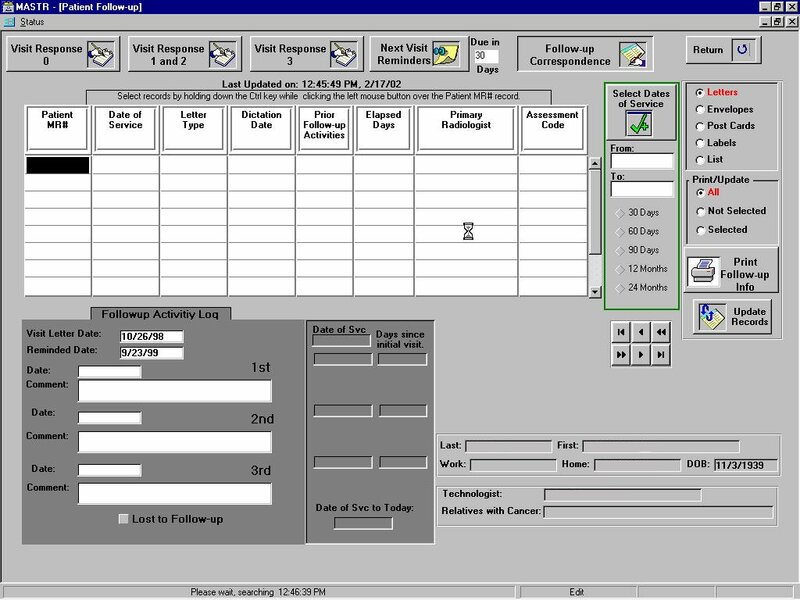 All tracking aspects from patient interview; processing of orders, radiology interpretation, histology recording, patient letters, reminder postcards, FDA reporting inspection, etc. ; are seamlessly integrated into a system with very few screens. In fact, one can read all interview, referral physician, primary radiologist interpretation, secondary radiologist interpretation, technologist comments, radiologist comments, pathology comments, histology, radiology orders, and patient demographics; all from one screen!